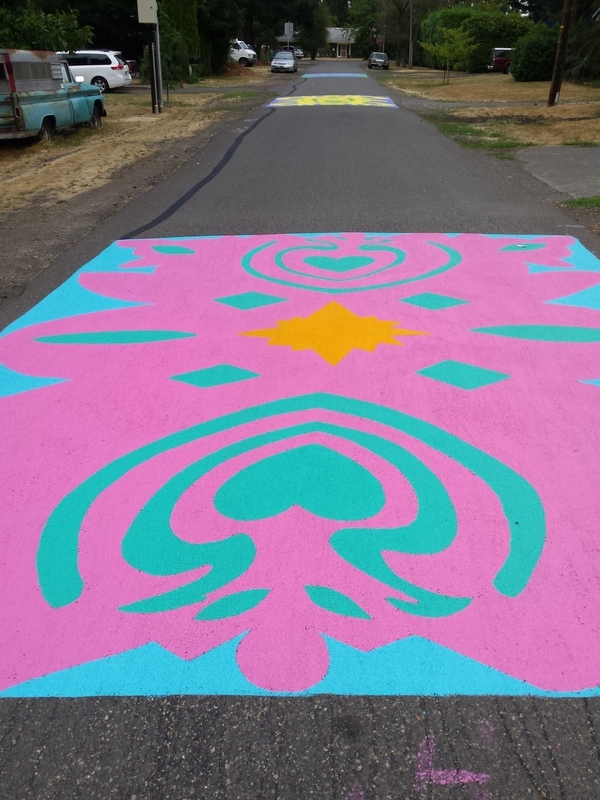 On August 1, an extended block of NE Wygant Street became the first to embrace Portland’s newly created Mid-Block Street Painting Ordinance. The neighborhood worked diligently over a blisteringly hot two-day period to lay down five “papel picado” style designs, brightly painted and arresting, enlivening the street. Neighbors worked from 8 am to 5 pm on both days: Day one entailed power washing, creating a design grid and transferring the pattern via chalk, then painting over the chalk outline. Day two involved paintbrushes and colorful paint-by-number fun. Residents of the block were joined by other Cully neighbors, and were interviewed by a visiting Dutch researcher and transportation official, here studying community building in Portland. After the painting was completed, people gathered for an annual block party. In addition to a potluck, Portland’s Unipiper performed and people danced, played corn hole and biked on the new and improved street. Thanks to assistance from Cully Association of Neighbors’ mini-grant program, 18 cans of paint, two long days and 40 hard-working volunteers, 5700-6000 NE Wygant Street has been transformed into a lengthy track of wonderfully adorned asphalt. Thanks to Grand Central Bakery, Fire and Stone, Starbucks, Fire on the Mountain, Annie’s Donuts, Sunshine Dairy, New Seasons and CNN for their kind donations!